What led you to this particular field of study? Originally, I was curious about John Muir’s religious and intellectual journey from his religiously strict childhood and youth to his adult career as founder of the Sierra Club and prominent voice for national parks. Also, my own religious upbringing and my environmentalist convictions and love of the outdoors got me interested in the ways religious background shapes ideas and attitudes towards nature. The more I explored the link between religious background to adult ideas about nature and environment, the more it impressed me as fundamental to so much of the history of environmentalism. 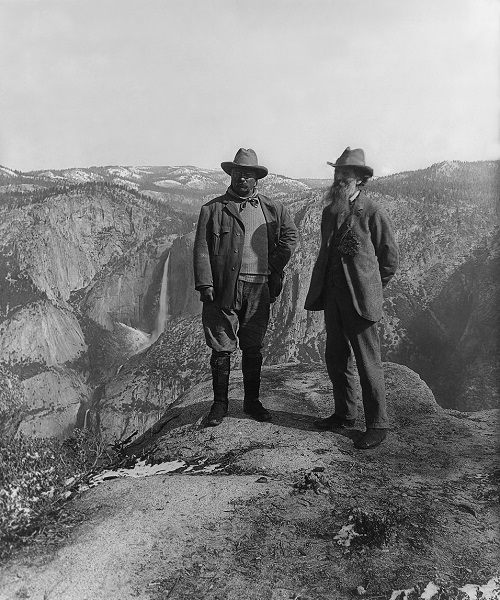 US President Theodore Roosevelt (left) and nature preservationist John Muir, founder of the Sierra Club, on Glacier Point in Yosemite National Park. In the background: Upper and lower Yosemite Falls. Public Domain via Wikimedia Commons. Was there anything that you found surprising when researching for this book? If so, what? There were three things that surprised me. First, I was surprised to find that nearly all the leading figures in the 19th-century conservation, forestry, and parks movements were no further that one generation removed from a Congregational Church in a New England town. This led me to discover the vital role the values and landscape of the New England town played in inspiring those movements. Second, contrary to what the literature on the origins of environmentalism would lead you to expect, hardly any of these figures acknowledged any significant influence from those great environmental heroes Emerson and Thoreau. Their influence came later, and for Thoreau, much later. 19th-century love of nature owed more to Calvinism than Transcendentalism! Last, I was quite surprised that the great leaders in the Progressive conservation movement were nearly all raised Presbyterian: John Muir of the Sierra Club, President Theodore Roosevelt, Chief Forester Gifford Pinchot, and Secretary of Interior Harold Ickes, as well as the lesser known but quite important President Grover Cleveland and Secretaries of Interior John W. Noble and Franklin Lane. The “Presbyterianness” of the Progressive movement is very striking. They were all very moralistic, and sometimes censorious and preachy. Do you think there are many misconceptions regarding the topic of your book? If so, what? The most common misconception is that religion has nothing to do with environmentalism, or is hostile to it. Inherit the Holy Mountain shows how tightly the two have been bound together. So many important environmental figures had a minister as a close relative, or even once considered becoming a minister or missionary him- or herself. It was a challenge to understand what it means to grow up in various religious traditions, both in the past and today. What does it mean, for example, to have grown up Presbyterian, Congregationalist, Baptist, Jewish, Methodist, Catholic, or black Baptist? A strong religious upbringing leaves distinctive traces in everything people do as adults, no matter what religious beliefs (or none at all) they adopt later. It was also challenging to dig up the childhood religion of many important and interesting figures. Often biographers and memoirists have not thought it an important thing to record. How do you think your book influences research today in your field of study? Hopefully, my book will show other scholars what a fruitful and mostly unexploited field lies at the intersection of religious history and environmental history. There is much work to be done, both in American environmental history and especially in world environmental history, to uncover those subtle, often hidden connections. Can you give us a fun fact about your field of study? It’s fun to meet with environmental historians. Most share interest in nature, the outdoors, hiking, birding, climbing, and all that. Environmental history meetings usually have field trips, including historical tours of parks, hikes, and birding trips, or sometimes something like a visit to a local organic winery. The meetings also feature tours of nearby environmental justice sites or toxic waste or other environmental problem, whether historic or contemporary, so they also have their more serious side. 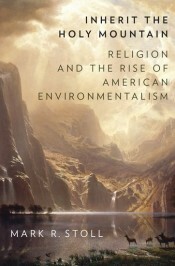 I have been invited to write on religion and the recent environmental movement in a book for Cornell University Press. What would be your top tips for an aspiring academic author? First, pick a topic that inspires passion and relates to your own experience. “Follow your bliss,” as Joseph Campbell advised. Don’t worry whether anyone else is working in the field. Hardly anyone else was working in mine, for example. If your work shows how interesting and significant your subject is, others will follow and your work will be more noteworthy than if you follow a trail that others blazed. Second, listen to your evidence. It will tell you the story you will want to tell. You may hear a narrative you hadn’t ever suspected. Image credit: “Muir Woods” by Ernest McGray, Jr. CC BY-SA 2.0 via Flickr.